b. Coach: Must have coached at least 5 consecutive years at the University of Wyoming with the final season completed at least five (5) years prior to selection unless he/she is currently on staff. If a coach is currently on staff he/she is eligible for nomination after fifteen (15) years of continuous employment as a coach at UW. Program improvement, won-loss records, national and conference championships, contribution to the sport on a state, regional, national or international level, and recognitions such as Coach of the Year are some qualifications. Any of these criteria must have occurred while coaching at Wyoming. c. Team: A team shall become eligible for nomination to the Hall ten (10) years after competition. The induction of a team shall not prohibit the separate induction of team members. d. Athletic Administrators or Staff: Must have been an administrator or staff member at least ten (10) years at the University of Wyoming with the final year of employment completed at least five (5) years prior to selection unless he/she is currently on staff. Administrators and staff currently employed at UW are eligible for nomination after twenty (20) years of continuous service in the Athletic Department. The administrator or staff member must have demonstrated exceptional loyalty, character, and a passion for the success of UW athletics and have identifiable contributions. e. Special Achievement: This category is reserved for people with a background of athletics at Wyoming who in their post-graduate lives have gone on to achieve success in a field of endeavor which has brought credit to the University of Wyoming and/or served the University in some exemplary manner related to athletics. 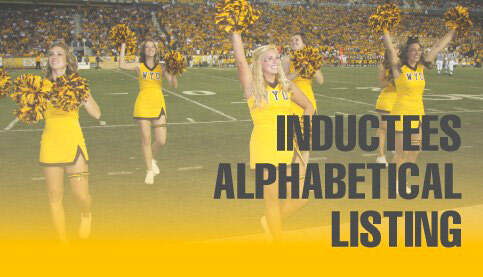 Examples would be: (1) volunteering many hours of service to the Athletic Department without pay, (2) successful professional career in sports as an athlete, coach, game official, or administrator, (3) league or conference commissioner, (4) journalism or broadcasting, or (5) an outstanding ambassador for the University of Wyoming in some form. There is no age nor years of service requirement for this category.